It's the second weekend in a row where I had plans but they fell through. Last Sunday, the 19th, a college friend, whom I have not seen in roughly 8 years, was to have a 3 hour layover in Chicago beginning at 12:30. There was a wedding shower for Niles and Jenn at 1, so, painfully, I decided to meet my college friend and forgo the shower. She wanted to leave O'Hare and, in 3 hours, one can do that, dash over to a close restaurant and have a somewhat leisurely lunch while catching up on who was where of our mutual friends and how life was treating each of us. As of the 16th, all was still good. On the 18th, she called to say she had to delay her return because of an illness in her family and she would be flying through on the 22nd. I do know she got home but suddenly, I had Sunday all to myself. Same thing happened this weekend. It turned into one of those lazy weekends where I did dishes and laundry and cleaned little spots here and there. I changed the bedding on the bed. Hmmmm. I'm matching the blanket to the cat or, considering the blanket is older than my daughter, maybe I'm matching the cat to the blanket. I swept. I washed. I played my game. I sorted. I pitched. I moved to another stack. Yes, yes, I know. Moving does not constitute "dealing with" the item. It just prolongs the decision on what to ultimately do with said item. I clipped claws, every. last. one, which is tough to do with Pilchard. Even having treats around for when she allows me to clip the claws, I can only do a couple paws before I have to let her go. She did, however, let me comb her for 20 minutes, 20 solid minutes. She just lay in her box and purred. I think I understand why she loves this box. This is how I usually find her when I come home from work or in the afternoon. 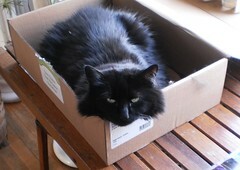 The edges of the box are just the right height for her to look out on the world and rest her chin on the side. She doesn't have to look up. She can just move her eyes side to side. This is the epitome of cat energy conservation, or laziness, but I'm calling it energy conservation. She let me comb everything except her belly, which is fine. 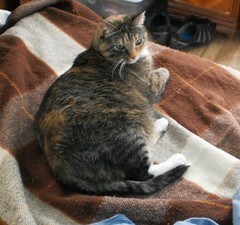 I found one small mat under her chin which came out easily. It also seemed as if I was combing out all her hair. I swear. I had enough combed out to create another cat. So, although I would have loved to see friends, being in the company of cats and having a lazy weekend is wonderful too.